The political satire goes on tour. During the 1980s, Yes Minister and Yes Prime Minister were as much as part of the comedy landscape as Only Fools And Horses. It was Margaret Thatcher’s favourite TV programme, and was arguably the first programme to shine a light on the inner workings of Whitehall and the role that civil servants play in Government. It was also one of the smartest sitcoms out there. Jonathan Lynn and Anthony Jay’s scripts displaying razor sharp satire and poking fun at the absurdity of politics without targeting any one party. The series ended in 1988, and with the deaths of the two lead actors, Paul Eddington and Nigel Hawthorne, the idea of seeing Jim Hacker and Sir Humphrey treading the corriders of power again seemed a pipe-dream. Surprisingly though, Lynn and Jay revived their best known work last year for a run in the West End – and it proved so popular that it’s now touring the country. This is no nostalgia piece; the script has been brought up to date with references to Blackberries, coalition governments, trouble in the Middle East, 24 hour rolling news and recessions. The plot revolves around the offer of a £10 trillion loan from an oil rich Arab country called Kumranistan to provide a pipeline that zigzags across Europe. The only complication is that Kumranistan’s Foreign Minister is demanding a night with an underage prostitute – it’s up to Hacker’s staff (Sir Humphrey, Bernard Woolley and the new addition of Hacker’s personal assistant, Claire) to find a solution. 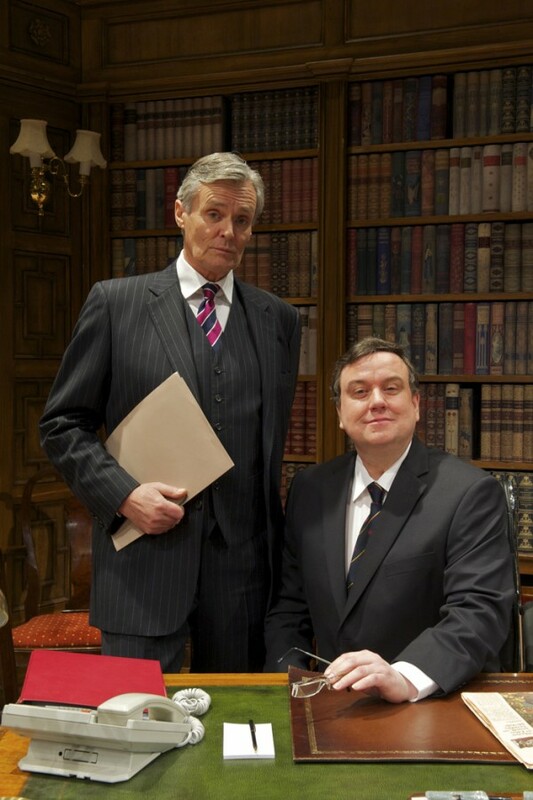 Richard McCabe and Simon Williams have the tough job of stepping into Eddington and Hawthorne’s shoes. Wisely, they don’t do impressions of their TV equivalents but McCabe perfectly captures Hacker’s hapless buffoonery, adding a manic edge to his performance as the play tips into farce. Williams cannot quite capture the oily charm of Hawthorne, and also seems to be struggling with a very croaky voice for this particular performance, but delivers Humphrey’s famously verbose monologues perfectly. Yes Prime Minister is at its best when satirising the relentless double-speak of the Civil Service – the stand-out scene where Bernard (a note-perfect Chris Larkin) answers a reporter’s questions draws many laughs of recognition. There’s enough dazzling wordplay and snappy one-liners to prove that Lynn and Jay haven’t lost their touch, even if the central theme of paedophilia gives the comedy an uneasy tone. Strangely though, there’s a slightly reactionary edge to the humour this time round. There are jokes poking fun at the European Union, global warming, immigration – and in one subplot unwisely and needlessly crowbarred into the second half, an entire section dedicated to bashing the BBC. Maybe the writers are just delighting in shedding the political neutrality needed for television, but it strikes an odd note for those who remember the even-handedness of the original. The pacing also flags in the second half, as the satire gives way to outright farce, and only really picks up at the end as a televised interview with Hacker is flashed up on the screens dotted around the theatre. Yet McCabe’s mounting desperation slowly turning into bewildered mania ensures that the laughs keep coming. For those people more familiar with programmes like The Thick Of It, Yes Prime Minister will feel rather tame by comparison. It never touches the heights of its parent television show, but it’s amusing and entertaining enough in its own right.